NYPD Commissioner Bill Bratton is stepping down as the city's top cop and will be replaced by Chief of Department James O'Neill in September, Mayor de Blasio announced Tuesday. De Blasio lauded the commissioner's contributions to New York City since taking over the job in January 2014 and praised the man who will replace him, a veteran cop with more than 30 years on the force who grew up in the city and whose experience he said will advance the work of neighborhood policing. Under Bratton, the city already has made plans to shift toward that strategy, one predicated on building trust and working relationships between police and communities. O'Neill has been heavily involved in those efforts, and de Blasio said neighborhood policing would be in place in 51 precincts as of this fall. "I don't think anyone could've imagined a more productive 31 months. 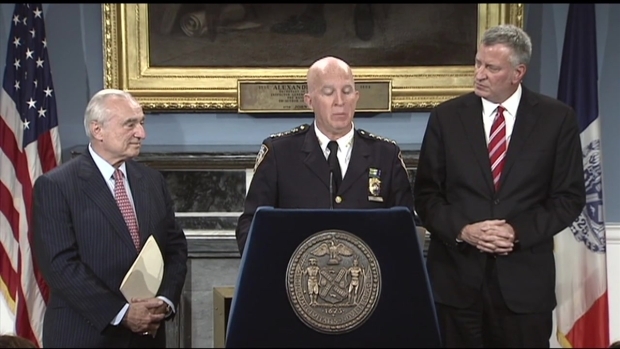 We will never forget or fail to honor the achievements of Bill Bratton," de Blasio said. Of O'Neill, he added, "Jimmy is the real thing in every way." 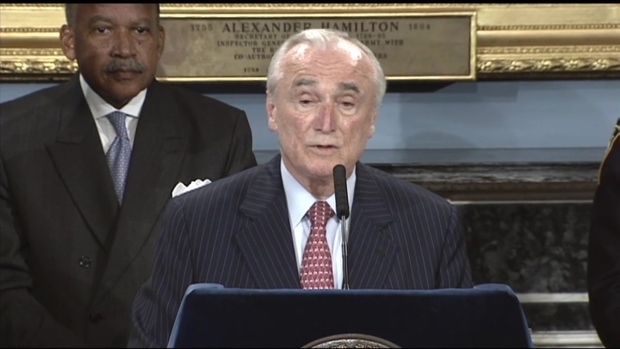 Bratton will stay on with the department until mid-September to ease the transition, officials said. According to a news release from global consulting firm Teneo, Bratton will join the company as the senior managing director and executive chairman of a newly formed risk management division. Sources close to the commissioner told NBC 4 New York that the job was a "perfect fit" for financial and lifestyle reasons, and that Teneo wanted him sooner than he had planned to be available. De Blasio joked that Bratton would be able to "afford" to take him out to eat in the new job. Bratton did not address the new position at the resignation announcement Tuesday, but instead reflected on his long-standing relationship with New York City and the people and politicians within it. The Massachusetts native called himself a "proud adopted son" of New York City and touted O'Neill's prowess, saying he would help make a seamless transition that, in this age of terror and sometimes volatile race relations, is more important than ever. NYPD Commissioner Bill Bratton said Tuesday he would step down in September, and indicated he could not be handing over the reins to a more capable colleague and exemplary department. The resignation comes days after Bratton told The New York Times in a widely cited interview that he wouldn't serve as the city's top cop after 2017. Law enforcement sources say he has been talking to de Blasio for at least a month about the possibility that he may vacate his office earlier. Bratton has served as the city's commissioner under de Blasio since January 2014 and was also the commissioner during the Giuliani administration. He is credited as one of the early proponents of the CompStat crime-tracking methodology and the "broken windows" policing philosophy, which prioritizes enforcement of minor offenses to prevent major violent crimes. He also served as the top cop in Los Angeles and Boston. De Blasio tapped Bratton for the job after campaigning on a promise to change police tactics and the department's relationship with New Yorkers. In announcing his resignation Tuesday, de Blasio vowed to continue that charge, and said O'Neill would be an extraordinary leader of the department. O'Neill said rather than look at the promotion as the culmination of the career "of an old transit cop like me," he said he sees it as an opportunity and invitation to advance all of the work Bratton has done in the last 31 months. "I love being a cop. I love this uniform. I love what it stands for," O'Neill said. "We are here for you, the people of this city." O'Neill spoke of his optimism for the future -- a hopefulness imparted to him by his mother. "Because of her I learned we can change the world into what we want it to be and that life is about much much more than just oneself, it's about all of us," O'Neill said, choking back tears. He also emphasized the importance of bridging the divide between communities and police, and reiterated that the department knows most of the crimes in the city are perpetrated by a few criminals. O'Neill said he would focus on zeroing in on those perpetrators as Bratton has done while working to protect the city from broader scale threats like terrorism. NYPD Chief of Department James P. O’Neill will succeed Bill Bratton as NYPD commissioner after he resigns his post in September, Mayor de Blasio announced at a press conference Tuesday. Despite some of the lowest crime rates the city has seen in history, Bratton's latest tenure as the head of the NYPD has been marred by tumultuous relations with the public and a tense standoff between the department's rank-and-file union and de Blasio following the killings of two officers in late 2014. But sources close to the commissioner say he feels comfortable leaving the post with the crime rates as low as they are and in the capable hands of O'Neill. 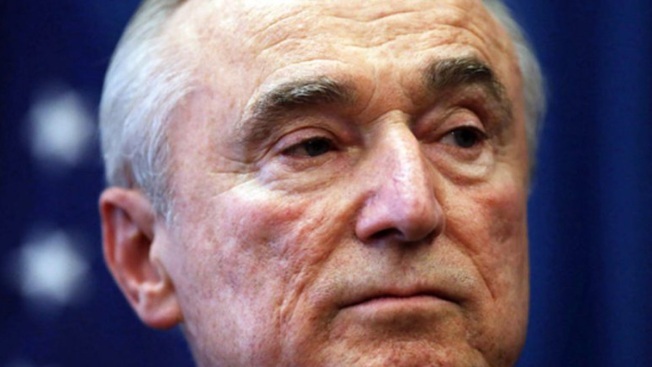 "I'm leaving because it's the right time," Bratton said Tuesday. The sources also said he wants to take more time for his three grandchildren, and that he wanted to leave before the next mayoral campaign. Ben Tucker, first deputy NYPD commissioner, will stay on, and Carlos Gomez, the NYPD's chief of patrol, who has been with the force since 1984, will take over as chief of department. Calling Gomez a great friend, O'Neill said he "has the will to make the change, the vision to make the change." The fate of others, including Deputy Commissioner of Intelligence & Counter-terrorism John Miller and spokesman Stephen Davis are unclear. Bratton's resume is unmatched in local law enforcement. He first held the top NYPD post in 1994 and is credited with leading the development of CompStat, a crime-mapping database begun in New York City that has been copied by police in other cities. Crime dropped significantly during his tenure, but civilian complaints about police misconduct and brutality went up. Somewhat coincidentally, protesters had staged a demonstration outside City Hall Monday night and Tuesday to call for Bratton's resignation. One protester said that he was "very happy" to see Bratton step down and that he "will take anyone over Bratton, even a corpse." The head of the Patrolmen's Benevolent Association, the NYPD's largest union, said that he "wishes him well in his new endeavors." Bratton, a Vietnam veteran who began his career as a Boston police officer, served as chief of the LAPD from 2002 to 2009, where he dramatically expanded the use of stop and frisk. On his watch as NYPD commissioner, the department drastically scaled back that strategy, but stepped up enforcement against of so-called "quality of life" offenses. Critics said that approach still unfairly targeted people of color. Bratton was also hired by Oakland, California, in 2013 to serve as a consultant to the city’s troubled police department.